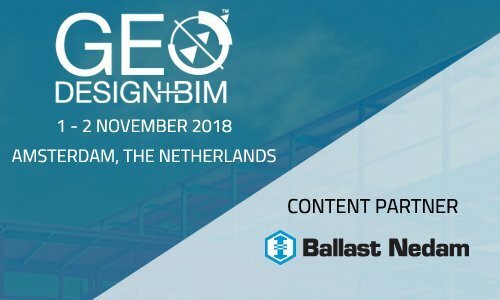 Amsterdam: GEO| Design+BIM, a platform that highlights the use of geospatial data analytics and Building Information Modelling (BIM) in asset spatial design, construction, and operation and maintenance, is pleased to announce Ballast Nedam as a Content Partner. The event is scheduled to take place from 1-2 November 2018, in Amsterdam. Ballast Nedam, a Dutch-based development and construction company, will be organizing a program on Virtual Building at the event. The program will focus on the importance of 4D-scheduling tools for virtual building in infrastructure and building sector. Paulus Eckhardt, Director Design & Engineering at Ballast Nedam, will be one of the speakers, along with a few other industry players. “Partnership with Ballast Nedam is a new approach that we adopted this year as an endeavor to enrich our program offerings at GEO|Design+BIM. The conference is on its way to be a true business user platform, and we’re beyond excited to present a more content-rich and user-focused conference to our audience,” adds Anamika Das, Vice President, Outreach and Business Development at Geospatial Media and Communications, the conference organizer. About GEO|Design+BIM GEO|Design+BIM is an exclusive event in Europe, highlighting and initiating discussions related to the use of geospatial data analytics and BIM in asset spatial design, construction, operation and maintenance. The event is a combination of two innovative platforms: GeoDesign Summit Europe and GeoBIM Europe, which were organized separately since 2013. Understanding the relevance and importance of bringing the geospatial analytics, spatial planning, architecture, engineering, construction and operation/maintenance professionals together on one platform, a combined effort was initiated in 2017, giving birth to this exciting integrated event. Visit www.geo-bim.org/europe to learn more. The post Ballast Nedam to organize a 4D BIM program at GEO|Design+BIM 2018 appeared first on BIMcrunch.